Master Franchise investors are granted an exclusive 20-year agreement (renewable for 100 years total) to operate in a defined territory. This franchise business opportunity gives the master franchisee the ability buy a business in North America and establish a regional office that sells individual Jani-King unit franchises, train the unit franchises, and secure cleaning contracts for unit franchises to service. Imagine the possibilities with this fast growing, nationally recognized business model and discover the revenue opportunities available exclusively to Jani-King Master Franchisees. The initial investment for a Master Franchise typically starts at $100,000 in U.S. territories and $250,000 in international territories (U.S. dollars). It's really been the American dream! 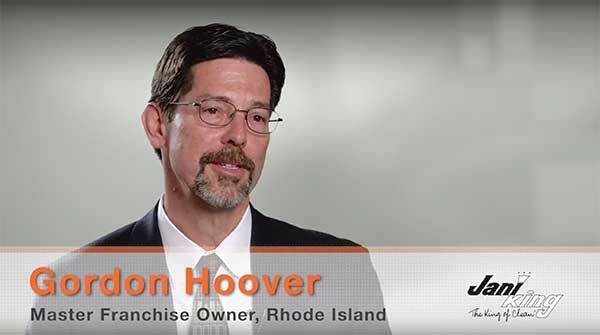 Gordon Hoover discusses the master franchise opportunity with Jani-King. Victor Berrios wants to give back and help his franchisees succeed. Debbie Sinopoli talks about how she takes advantage of the support she receives from Jani-King. Rich Henderson talks about his road to owning a Jani-King franchise. How Much Does a Cleaning Franchise Cost? Which Franchise Path is Right for You? Commercial Cleaning, is it Your Next Step? Starting a Business: Cleaning Franchise or Startup? What can you clean with a Commercial Cleaning Franchise? Starting a commercial cleaning franchise might be the right move for you.